We often run around like mad trying to put a meal on the table, and in our haste we forget that cooking can be a huge part of the fun. 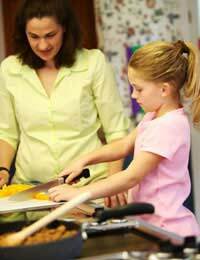 Teaching children to cook from an early age will set them up for life, helping them to learn about healthy eating and nutrition as well as how to be independent. To start, you will need to assess your child's interest, abilities and attention span. Young kids can help measuring, mixing and washing fruits and vegetables, while older ones will be able to cut, chop, and even put food in the oven. You will need to decide what is safe for them. Next, find a recipe your child will find fun, interesting – and delicious. It's no use making a healthy meal they won't want to eat, like liver and onions or broccoli pie. Let them have a say in what your prepare, then go for it! Helpful hint: Decide for yourself whether your children will be equally happy helping you prepare a dish, or whether they want to cook something themselves from beginning to end. Some youngsters will be happy knowing they lent a hand in even the most complex recipe: others will prefer making something simple they can prepare all on their own. Cinnamon Toast. Mix three tablespoons sugar, one tablespoon cinnamon into bowl. Stir together well. Toast pieces of bread, spread with butter than add mixture and enjoy. Fruity Porridge. Whip up this fruity breakfast by stirring together porridge and milk, then adding pre-sliced berries, cherries or small apple pieces and cinnamon, if desired. When done add more milk and honey. Breakfast Pizza. Buy uncooked ready-made pizza dough. Mix up scrambled eggs with a little water, shredded cheese and pieces of chopped sausage. Pour in middle of dough, making sure there is a lip so it doesn't pour out. Cook in preheated oven until eggs are ready to eat. Morning Sundae. Get tall glass and fill bottom with strawberry or raspberry jam. Add several layers of Cheerios. Slice several strawberries into small pieces and place in glass. Add layer of yoghurt, another layer of Cheerios, then another strawberry. Top with yoghurt and strawberry. Baked Potato Supreme. Let your child wash a potato and prick it with a fork, then place in oven. While it cooks, help them prepare a simple filling: tuna salad, egg and cress or baked beans and grated cheese. Help them to fill potato after it has cooled down a bit. Teddy Bear Sandwich. Ask your child to spread filling on bread, either butter and jam, peanut butter and jam, or honey and butter. Then use a biscuit cutter to cut into fun shapes, such as a teddy bear. Place on plate and garnish with healthy veg. Face It. Give your child a plateful of ingredients you know they like, such as black olives, ham, crackers, cherry tomatoes, cheesestrings etc. Encourage them to make a face on the plate with tomatoes for eyes, cheese for hair etc. Then eat it! DIY Pizza. Buy ready-made pizza dough. Have your child help you prepare bowls of grated cheese, tomato sauce, olives, sliced pepper, pepperoni, onion and ham. Then have them make their own! Perfect Pasta. Make pasta, drain. When still warm, let your child add his or her own ingredients. Whether it's grated cheese and butter, pesto or even ketchup (! ), they will have the satisfaction of creating their own meal. Help them make salad as an accompaniment. Divine Decorating. Buy ready-made sponge cake or fairy cakes and pre-made icing. Let them ice the cakes, then decorate with sweeties, nuts, sprinkles etc. Looks delicious and only takes a few minutes to prepare! Marvellous Mixes. Help your kids cheat from an early age by making baked goods from a ready-made mix. Whether they help whip up a quick cake or batch of chocolate chip cookies from a mix, they will learn about basic measuring, sifting etc but won't get bored easily. Cooking can be great fun for small children, and helping them start with quick and easy recipes will set the foundation for moving on to something more complicated. Combine learning how to cook with information about healthy eating, nutrition, kitchen safety and basic hygiene. They'll love it – and hopefully you'll love the food they create.